The Royal City Palace, home to the royal family, was built between 1729 and 1732 AD by Sawai Jai Singh II. Despite of the current palace complex includes multiple buildings, gardens, courtyards and planetariums, initially only the central part of the palace was built. Successive rulers added more and more to this historic complex. 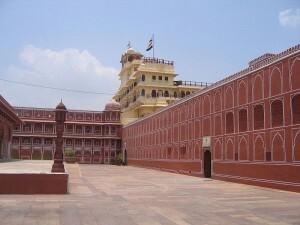 Today, the royal family still resides in the Royal City Palace in Jaipur. You may follow these guidelines to choose the areas that interest you most. Chandra Mahal – where the current royal family resides. The shastra of 7-storey for the palace of kings is implemented here. The ground floor Pritam Niwas is opened to public. Exhibits of ancient manuscripts and artefacts like old uniforms of various rulers can be seen. The remaining areas are reserved for royal family use only and entrance is prohibited. The three entrance gates of the palace namely Udai Pol, Virendra Pol and Tripolia Gate are all richly decorated. Though the Tripolia Gate (triple gate) is reserved for the royal family, visitors shall proceed to the Udai Pol or Virendra Pol for entry to the palace to enjoy the showcase of heritage property. The Virendra Pol entrance takes you to the Mubarak Mahal (Palace of Welcome). It was built by Madho Singh II in 1900 to receive foreign VIPs. Ramayan (Indian literature), Razm-Nama (famous Jaipur carpets), antiques and weapons were displayed here for the guests. From 1925, it was used as an office of the council of states or Mahakama Khas. Nowadays, it is the Tosha Khana (royal wardrobe) museum where you can see lots of find silks, muslins and embroidered coats. This was once where the Maharajas conferred with the nobles and minsters during crisis. Now it is the home to the Guinness Record breakers – two large sterling silver urns. This is the courtyard of the Chandra Mahal. Dance and performances were carried out here for the royal family. Worth mentioning are the four gates which are decorated with the theme of four seasons and Hindu gods. They are the Lotus Gate, Rose Gate, Peacock Gate and Leheriya Gate (Green Gate). Bright colours, blossoming flowers and Hindu gods are everywhere. This museum houses the collection of chariots, palanquins and coaches (baggies). Don’t miss out the Victoria Baggi which was a gift from the Prince of Wales to the Maharaja in 1876. While the Thakurji ka ratha is the chariot that carries the idols of Hindu gods in festivals. Sileh Khana literally means weapon storage. It has the finest collection of both antique personal weapons of the maharajas and weapons of all kind for the royal arms. You will find swords of excellent craftsmanship, daggers, handguns, armours, helmets and etc. Jantar Mantar and Hawa Mahal Bazar is just opposite to the palace.